When choosing materials for a new installation, it is important to carefully consider corrosion rates. Oglaend System has a long and successful track record in some of the world's harshest environments. Many of our customers operate in highly corrosive environments – coastal, industrial and offshore areas. Most metals suffer from corrosion damage when exposed to certain conditions, however; the degree of corrosion associated with a specific environment varies between different materials. Technically, corrosion is a general term used to describe the conversion of refined metals to their more stable oxides. Galvanic corrosion may occur if there is contact between metals with different electrode potentials in a humid climate. Water acts as an electrolyte and the metals as electrodes, like a galvanic cell. Typically, the least noble metal is dissolved, leaving the more noble part free from corrosion. Many factors affect environmental corrosion, including, but not limited to, water chemistry, humidity and degree of condensation. The corrosion rate of zinc is more than ten times lower compared to carbon steel. Zinc is therefore a supreme choice for corrosion protection. 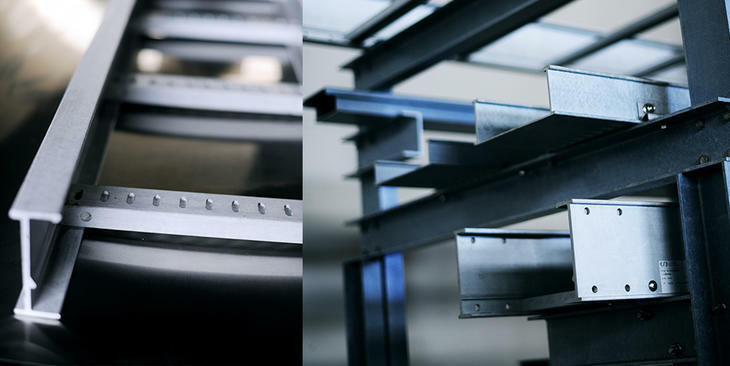 For our Hot Dip Galvanized (HDG) systems, steel products are dipped into molten zinc. This gives an alloy coating layer that significantly reduces corrosion rates. Stainless Steel (SS) contains high amounts of chromium. The addition of chromium leads to the formation of a thin passivation layer on the surface. This allows for contact with water and other electrolytes without corrosion, which would be experienced with unprotected carbon steel. Oglaend System produces our systems in 316/316L grade and A4 fasteners, which deliver high resistance against corrosion. 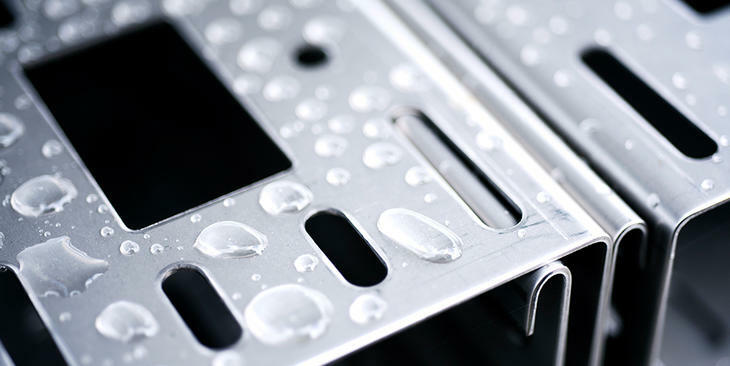 Under extreme circumstances the passivation layer on Stainless Steel can break down. In these environments, our Fibre Reinforced Plastic (FRP) products are recommended as they do not corrode. Galvanic corrosion may be prevented by ensuring that all components in direct contact share a similar finish, for example all in Stainless Steel(SS) or Hot Dip Galvanized(HDG). Alternatively, dissimilar materials should be insulated from one another. It is not advised to rely only on paint to insulate components, as the paint will only serve as a temporary solution, and will quickly wear off when subjected to loads or environmental damage. A preferred solution is to insulate the components using a solid and non-conductive material such as our own PTFE insulation plates. During construction it is important to avoid welding spatter. 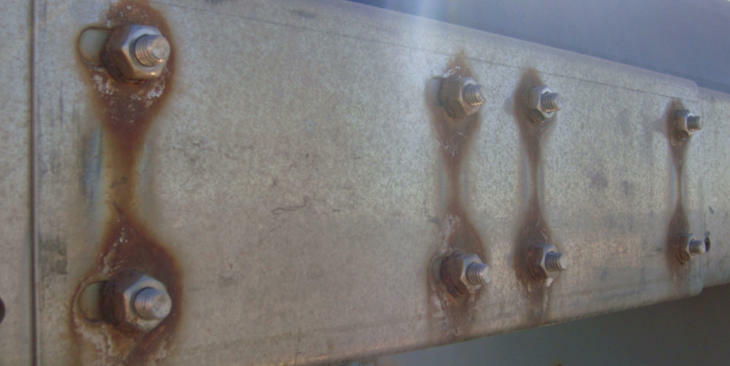 Should welding spatter occur and the components are not adequately cleaned, galvanic corrosion may occur as a result. Oglaend System offer documents detailing how to clean stainless steel, which are available upon request for our customers. It is recommended that exposure tests are conducted whenever a new installation is planned. This allows for an accurate determination of the environment’s corrosion class, and consequently; making the right material choice.